Taking his passion for employee engagement and social media fanaticism to the air, Mint Sales Executive Francois Pienaar was featured on the Big Small Business Show on February 7, 2017 to debate the value of involving your employees in your marketing strategy. The emphasis of Pienaar’s discussion was that, ultimately, employees are all brand ambassadors for an organisation and enable the most powerful form of marketing; word of mouth. Therefore, involvement should also be formalised through social participation encouragement guided by policies. 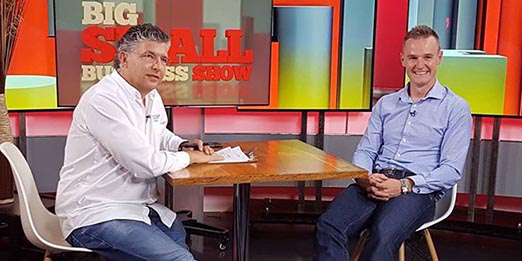 When The Big, Small Business Show host Allon Raiz, CEO of RaizCorp, asked Pienaar why business owners should consider employees as brand ambassadors, he responded that “It’s not about considering them as ambassadors as they automatically represent your company outside the workplace. Therefore, they are brand ambassadors upon employment, and organisations should be more proactive, focusing their efforts on ensuring that they spread positive messages. Pienaar added that, with 30% of employees engaged, 50% not engaged and 20% actively disengaged, organisations need to try and move that needle to get more for less and squeeze productivity out of employees. This can be achieved through internal platforms (Intranets) where employees can have discussions, share information, get to know each other and make the move from a workplace to a family. If employees feel like they are part of something that is growing and fulfillling their lives they will reflect this passion externally on sites such as Twitter, LinkedIn and Facebook. He added that final responsibility for social media messages and word-of-mouth referrals gone wrong should sit with the HR and Marketing departments and collective efforts should be introduced to manage and direct employees. The Big Small Business Show, BusinessDay TV, DSTV channel 412. Mint Management Technologies is a global IT consultancy that is in the top 5% of global CRM providers as well as a member of the Microsoft President Club. The company enables better business by digitally leading its clients through Customer Centricity, Employee Engagement and Smarter Systems in the digital space.